A place like Hennessey Street exists only in dreams – maybe. Four generations of women lead very different lives on this street. Denise DelMonico, an athletic high school senior who never learned to read, anxiously waits for word of a scholarship. Making minimum wage as a waitress, Kay Curley struggles to make ends meet. Jessica Charles, never quite making the A-list, continues to hope for her big acting break. And then there’s Marylou Washington. Marylou has lived on Hennessey Street for more than seventy years and has watched the neighborhood change with each decade, each new president, and each wave of immigrants that moved in. Hennessey Street is a story that stirs memories in all of us with the hopes and dreams of the future embodied in one neighborhood. 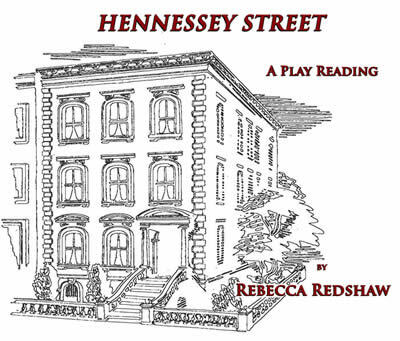 Hennessey Street is a play written for four women. Two versions exist; one for white actresses and one for Afro-American actresses, or any combination thereof. Port Angeles Community Playhouse, Port Angeles, Wa. Peninsula College-Benefit for Clallam County Literacy Council, Port Angeles, Wa. St. Luke’s Church, Sequim- Benefit for Clallam County Literacy Council, Sequim, Wa. Zonta International Conference, Pittsburgh. Pa.